The Mimico Secondary Plan includes two clauses that override the 25 storey maximum height. As the City Planning Department is well-aware, the designated Neighbourhoods lie fully outside of the Secondary Plan area, on the west side of Lake Shore Blvd West, and much further away at Miles Rd. 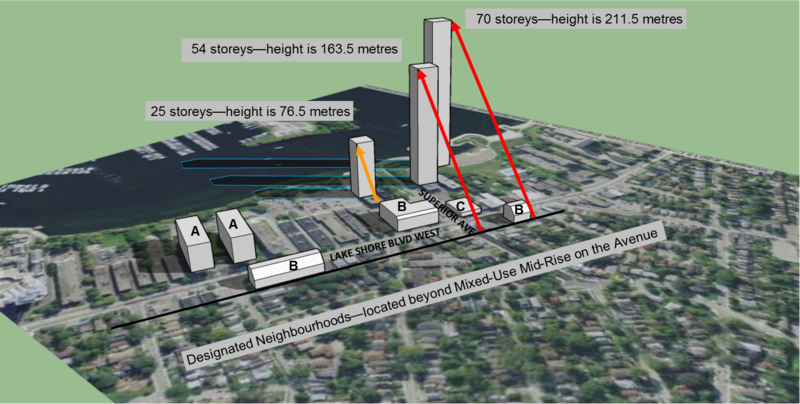 From the above drawing, you can see that including these two policies (in RED) permits developers to override any maximum building height limits set out in the Mimico Secondary Plan, such as 25 storeys, as well as the angular planes described in the Tall Buildings Design Guidelines, as long as their buildings fit under the angular plane described in the above two clauses. The angular planes from the Tall Buildings Design Guidelines applied to a 25 storey building is shown above in YELLOW. Note the shadows from the 3 buildings outlined in BLUE on the Mimico Waterfront Trail at 3 P.M. on September 30. A row of these buildings will put the Waterfront Trail in permanent shadow at 3:00 P.M. The LAKESHORE PLANNING COUNCIL CORP. has asked the City Planning Department to remove Policies 4.2.4. b) viii. and Policy 4.2.4 c) vi. from the Mimico Secondary Plan and has appealed to the OMB to have these policies removed (among others) and permit the Tall Buildings Design Guidelines to apply. Please provide your support so that LPCC may obtain legal and professional planning advice to assist us at the OMB. TEN REASONS FOR $10 To contribute: SHOP THANK YOU FOR YOUR SUPPORT. At a duly constituted meeting of the Lakeshore Planning Council Corp. held on September 26, 2013, it was resolved that LPCC would join as a Party to Appeal the adoption of the Mimico Secondary Plan. A SubCommittee has been formed to prepare for the OMB pre-hearing. Members, please let us know if you wish to work with this SubCommittee. 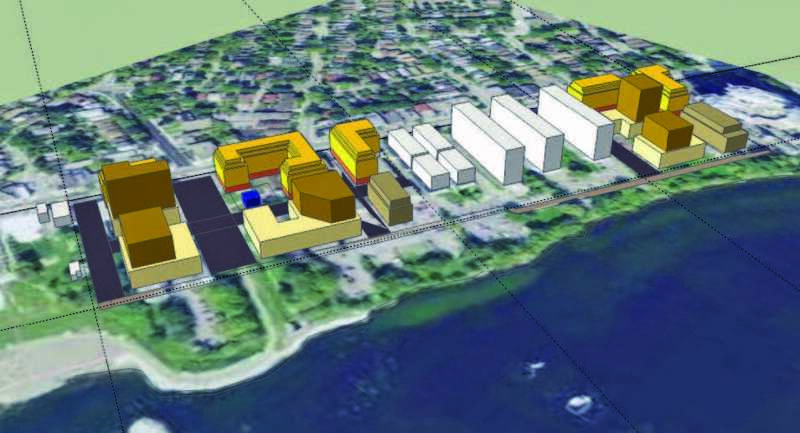 On July 16, 2013, City Council adopted the proposed City Planning Secondary Plan for Mimico. Various City and Consultant reports are found here. The matter has been appealed to the OMB. A Hearing is scheduled for February 2015. A brief critical outline of the proposed City Secondary Plan is found below. The MIMICO BEACH SECONDARY PLAN ALTERNATIVE has mid-rise buildings to 8 stories on the Avenue, to a maximum height of 14 stories for buildings behind the Avenue buildings, and up to 10 stories overlooking new parkland and the Mimico Linear Trail. The buildings are “Mixed Use” to include 81,249 sf of business/retail on the ground floors. The buildings also include replacement of the 698 existing rental apartments, and the addition of 888 new condo apartments at an average size of 650 sf and 850 sf for one and two bedroom units, respectively. The Plan includes approximately 3.9 acres of land currently designated under Toronto-Mimico zoning by-laws since the 1960’s as green “Temporary Open Space” located between the buildings and Lake Ontario to be dedicated as parkland by developers (or purchased at approximately $4 million by the City) to create new parkland adjacent to the new Mimico Linear Trail, for the current and future, growing population of Mimico, Toronto and the GTA. A MIMICO BEACH PROMENADE separates the buildings from the new MIMICO BEACH PARK. The Promenade is for walking and cycling, but not cars; however, it is wide enough for emergency vehicles, park staff vehicles and police cars for monitoring the Park. The proposed CITY SECONDARY PLAN includes 15 and 25 story buildings that run along the Mimico Waterfront. At 25 stories, these new high-rises clearly dwarf the remaining existing buildings, the Shoreline Towers at 10 stories (white buildings-to the right) and Kilcooley Gardens Co-op at 3 stories (white buildings-to the left) and cast unwelcome shadows on the shoreline in the afternoon. 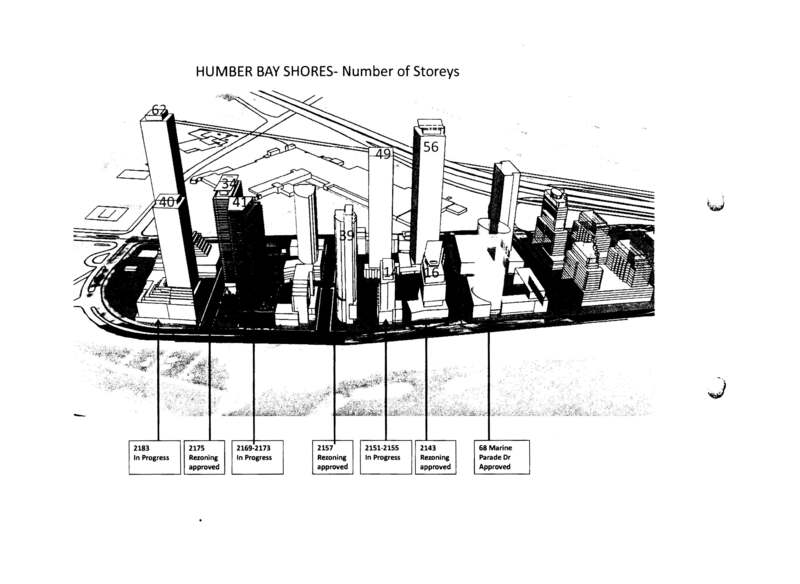 In reality, once high-rises are permitted on the Mimico Waterfront, they will certainly be higher, with developers appealing at the OMB and pointing to the 60+ story high-rises at Humber Bay. The Toronto Waterfront should be preserved as green space for all residents of Toronto and the GTA and for future generations. Preserving the waterfront for all citizens is a common and equitable practice found all over the world, recognizing that permitting a few wealthy individuals to profit from limited waterfront land is unreasonable and unfair. The City Plan is disingenuous and does not follow the Toronto Official Plan. It must be revised or reversed. It is clear that the newer high-rise buildings at Humber Bay are double the heights of the older high-rise condominiums, located to the right of the picture. Undoubtedly, this is what is being planned and will be constructed on the Mimico Waterfront in future, unless residents and citizens of Toronto take action and support a Mimico Waterfront that is in the best current and long-term interests of all Toronto residents: protect, preserve and increase our Parks and green spaces on the waterfront for the benefit of all and not just a few.